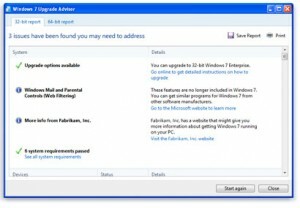 Run the Windows 7 Upgrade Advisor. This Windows XP app will scan your PC and determine if you can run Windows 7 effectively. It will even suggest fixable upgrades and other issues that you can resolve before you upgrade, and will also tell you if some of your applications or drivers will stop working under Win 7. Back up your stuff. Read about our recommended backup software. Transfer your licenses for products like Microsoft Office. You may need to call Microsoft to do this. Yes, we don’t know why it’s still not an automated process. Place your Windows 7 CD in the drive, but close the menu that appears. We’re going to do a full install rather than an upgrade. 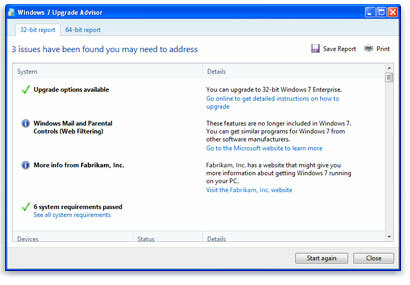 The Upgrade Advisor determines if your PC can handle Windows 7. Find out how to enter your PC’s BIOS, which contains the settings built in to your PC. Google “Manufacturer Model Number BIOS” to do it. For example, this laptop is a Toshiba Satellite L675. Googling “Toshiba Satellite L675 BIOS key” tells me that the key is F2. Enter your BIOS by rebooting and pressing the key above before the Windows logo appears. Change the boot order to boot from CD/DVD first, then save and quit. You’ll see the Windows 7 installation screen appear. Click Install Now. Click Custom, rather than Upgrade, as you’re doing a clean install. Choose your current drive (usually C:) and choose to format it. 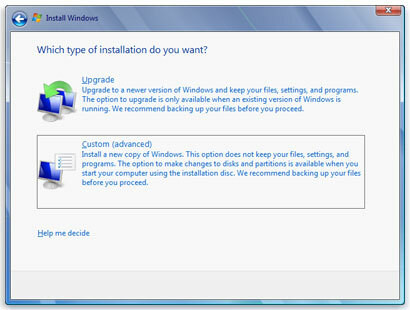 Windows will attempt to save your current installation if there’s room, but that’s not always possibly. Luckily, you ran a backup earlier. Enter the Product Key when asked. It comes with Windows 7, so don’t lose it. Your PC will reboot numerous times throughout the process. 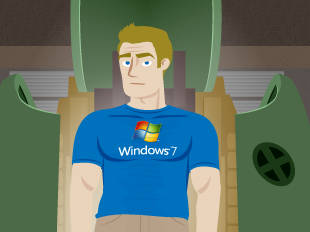 When it’s all done, be sure and run Windows Update so that you’re using the most current version of Windows 7. Also download and run Driver Reviver to be sure all your Windows 7 drivers are up to date. Be sure and choose Custom for a full installation. Enjoy! And rest assured, Microsoft is going to support Windows 7 for a long time. No need to worry about Windows 8 for some time. Here’s an interactive video blog that covers the upgrade from XP to Windows 7 upgrade process.